Welcome to a fantastical world of INSPIRATION and MAGIC! 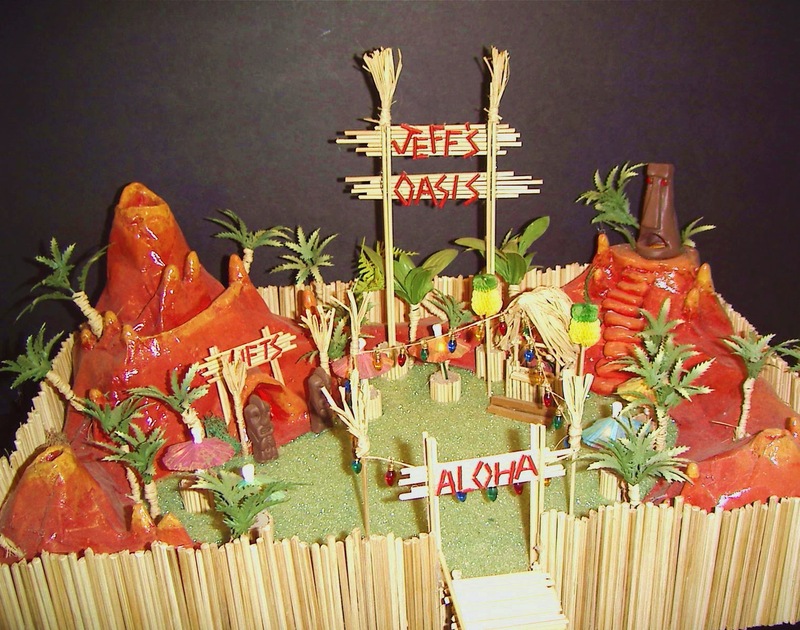 This project is a "Re-do" or "upgrade" of a tiki bar/resort model I designed called JEFF'S OASIS. I made this as a gift for my partner Jeff in 2001. 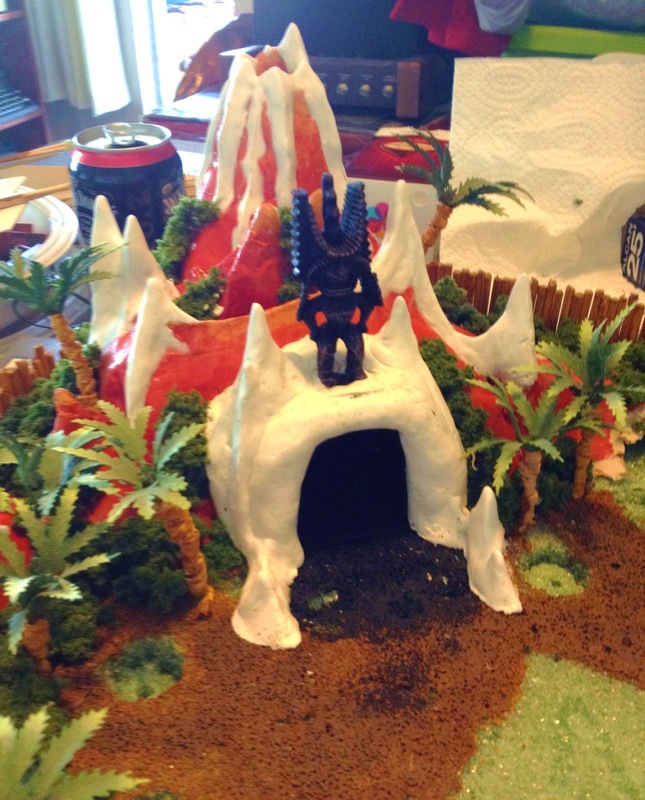 He is a huge fan of tiki culture and it was his birthday so I made him a model of an imaginary resort with a tiki theme. 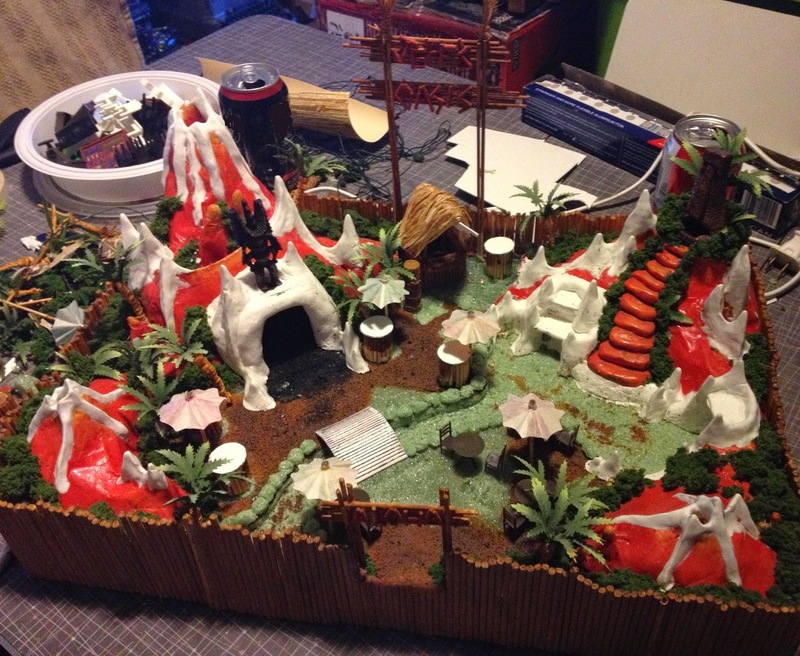 I took inspiration from "The Book of Tiki" which features many tiki bars and tiki culture, including Danny Balsz' "The Tikis", a 1960s tiki bar featuring an outdoor floor show and erupting volcano. Now 13 years later I decided Jeffs Oasis needed an upgrade!! I re-did the entire entrance stairs and main gate. I used the old bar as a new peak roofed and added some tikis we bought in hawaii as statues. The whole model is in 1/4 inch scale. There were many toothpicks and bamboo scewers used in the making of this model. I bought this small wooden tiki in hawaii...its probably 1.5" tall. 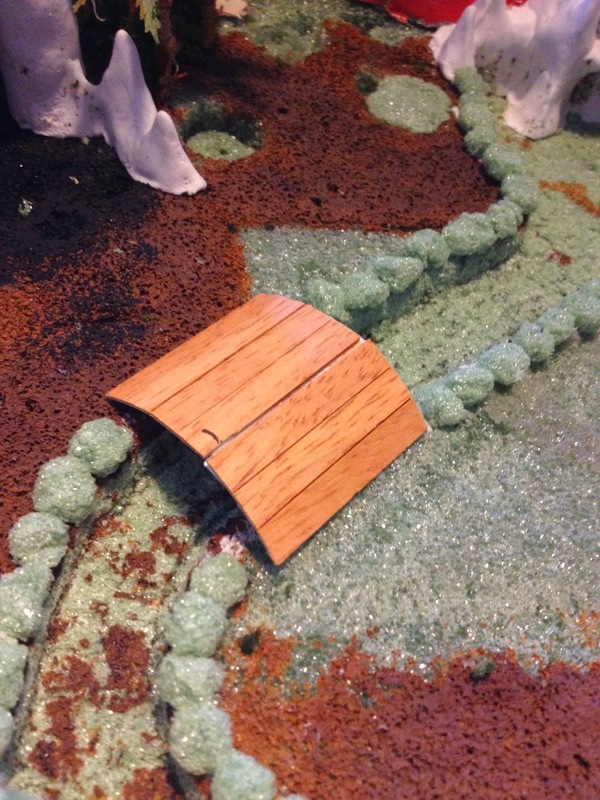 I added a new water feature to the park, as well as a new bridge. 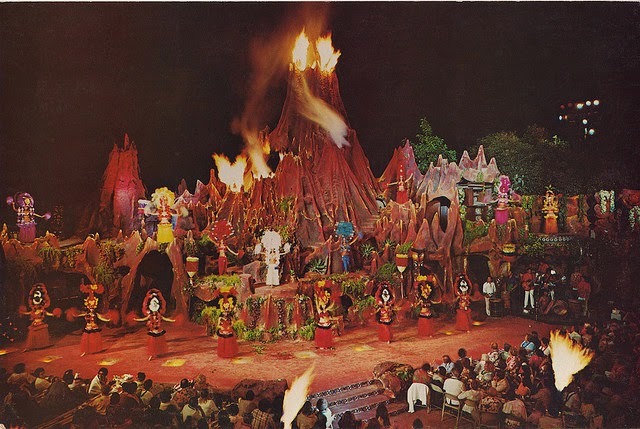 The mouth of the tiki god has now become the stage for the outdoor floor show, including waterfalls, boat, stages and more peaks. The water is all made from melted glue gun and a painted base. The old giftshop inside the vocano has now become "Taboo" adult showlounge. Surrounding it is the outdoor lounge area for taboo. The tiki god was another small souvenier from hawaii. The sign now has many gas torches all over it, as well as some new palm trees. The ourdoor bar is new and much smaller. I created some VIP leather seating for the outdoor floorshow. And places to get close to a loved one. 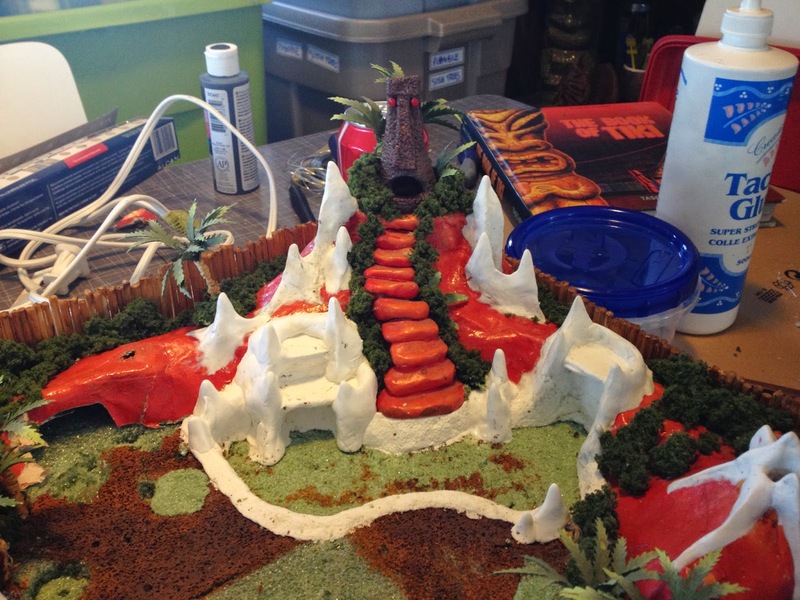 I used the styrofoam base to create vocano style rocks to line the moat. Birds eye view shows the layout much clearer. Of coures the whole thing had to be re-lit with lights. Looks great in the dark. Here are some vintage Muppet View-Master Images. I captured these myself with a lamp and a macro zoom setting on my camera. It was pretty easy:) Some of these images are pretty iconic! Hope you enjoy! !